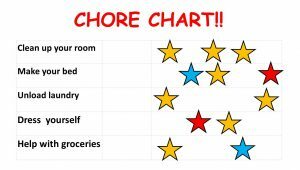 Every child can help with chores! Everyone grows up doing their own little chores, so why not have your little one learn and do the same? Not everyone has the opportunity where both parents can help teach them. Chores can give kids a sense of independence and worth. They are able to see cause and effect, “If I clean this, I’ll get this” and real progress. Many families implement chores in their homes; are you ready? If your 4 year old wants to help with everything or be in everything, let them!! There is going to come a time when they’re going complain about doing everything, so take advantage now! A lot of times we parents are overwhelmed trying to figure out what age appropriate chores for our kids. “What are they capable of doing?” and “Am I mean for making them clean?” are questions that run through our heads. Understand that you are your child’s best advocate, and ultimately, you want them to be strong and independent. 1. Clean up their room/toys; label the buckets with pictures so your child knows where things go. 2. Making their bed; May not be prefect, but still let them try! 3. Help with groceries. Throw in incentives sparingly and talk about what great help they are etc. 4. Unload laundry. Just placing it in the basket takes one thing off your list, and your kids truly want to help! 5. Dress themselves/doing their hair. LOL, why not? Set out 2 outfits and then your child will feel like they get to be in charge. Plus if they wear shorts over their pants, is it really going to matter in the long run?